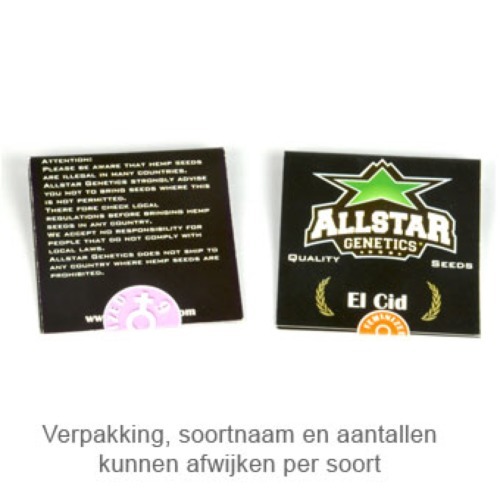 El Cid from Allstar Genetics are feminised cannabis seeds with very powerful genetics. This strong weed plant is a combination of a Moroccan Sativa x Hash plant x Cheese. This plant is a very popular weed strain. This plant is originated by using a Spanish breeder. Allstar Genetics El Cid is suitable for an indoor grow and outdoor grow. This weed plant belongs to the top 10 with the highest yield, although she needs some care. Therefore it is important to have some experience with growing cannabis. The effect of smoking this weed is a physical and heavy deep stoned feeling. A perfect weed when you just want to relax on the couch. Tell us and our customers what you think of the El Cid from AllStar Genetics.